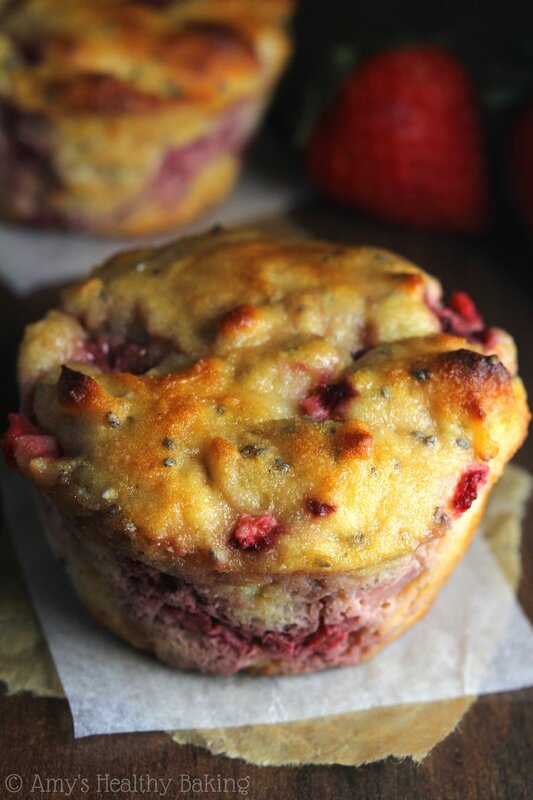 Tender muffins packed with protein & bursting with juicy fruit! With 3 superfoods, they’re the perfect breakfast or snack. Nobody will guess they’re healthy! My mom valiantly stepped in to pinch hit and gamely agreed to head to the stadium with me, even after waking up at 4:45 am, working a full day, and spending 3 hours in traffic. My mom is the best. Although the general population may find the game boring, that’s what baseball feels like to me. For the next four hours, we clapped, shivered, shouted, and cheered our favorite Oakland A’s through their pregame festivities and nine innings to victory—a truly amazing moment since they hadn’t won Game 1 of a season since 2004! But after driving home and collapsing into bed, life went straight back to the daily grind. 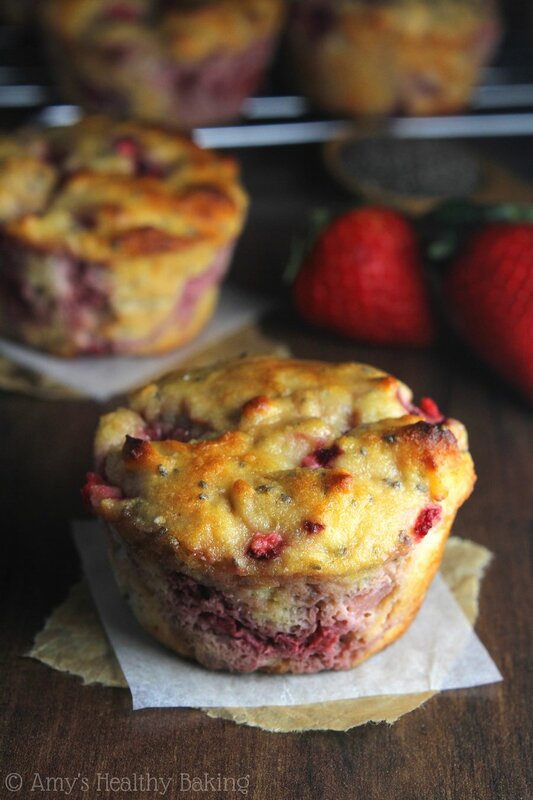 With my alarm clock ringing a little earlier than I would’ve liked, I was really glad to have these Strawberry Lemon Chia Seed Protein Muffins to get me through the day! Let’s talk a little bit about these gorgeous beauties! To start off, they’re entirely gluten-free. Coconut flour and protein powder make up the dry ingredients, with a touch of xanthan gum to help the muffins hold their shape. No, they don’t taste like coconut! Just really sweet and fruity—like spring! Note: I have only tested the recipe with this protein powder. Not all protein powders absorb liquids equally. If you find your muffin batter is too dry after letting it rest, add a little more milk. If it’s too wet, add a tiny bit more coconut flour. To keep the muffins moist and add to their protein punch, I turned to Greek yogurt. It’s my secret ingredient in healthier baking, and I’ve used it in countless muffins, cakes, cupcakes, and even frostings! In this recipe, it simulates the moisture of butter or oil for a fraction of the calories. 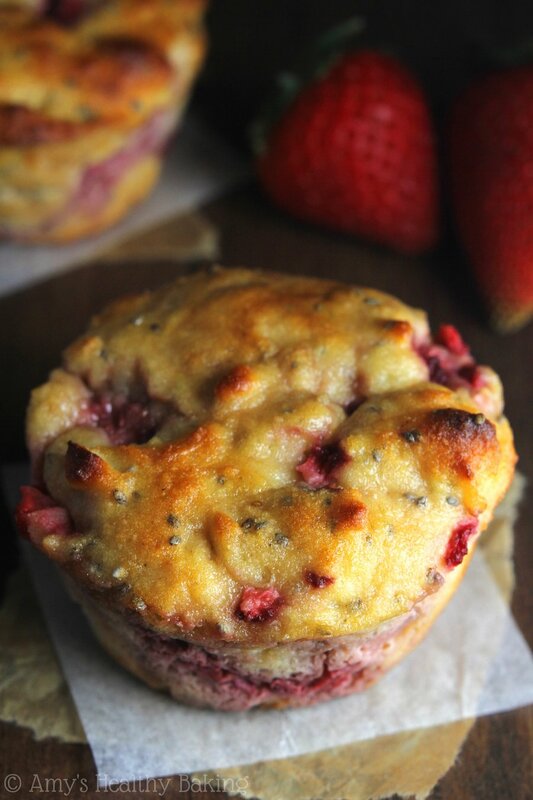 Not only are these healthy muffins full of protein and bright sunshiny flavor, they contain three superfoods: strawberries, lemons, and chia seeds! How’s that for a great way to start your morning? I pack as much fruit as I can into my muffins, so there’s a full cup of strawberries hiding inside, plus the juice and zest of lemons. All of that fruit makes these muffins absolutely irresistible! So here’s to spring, baseball, and sweet clean-eating treats! 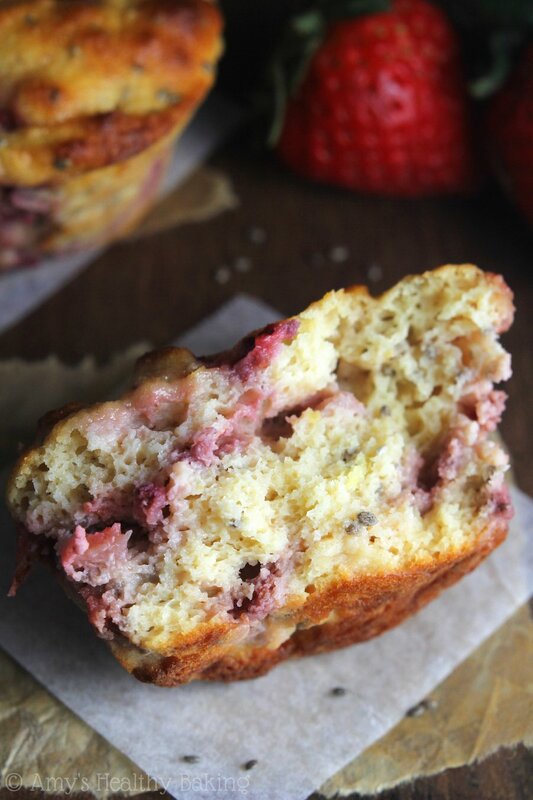 These muffins are bursting with bright sunshiny flavor and sweet berries! They’re ideal for quick grab-and-go breakfasts or snacks. Store any leftovers in an airtight container in the refrigerator for up to 6 days, and reheat individual muffins in the microwave for 13-16 seconds. Divide the batter between the prepared muffin cups. Bake at 350°F for 25-28 minutes, or until a toothpick inserted into the center comes out clean. Cool in the pan for 10 minutes before carefully turning out onto a wire rack. Notes: Any milk (cow, soy, cashew, etc.) may be used in place of the almond milk. I have only tried this recipe with this protein powder. Not all protein powders absorb liquids equally. If the batter seems too dry after letting it rest, add additional milk 1 tablespoon at a time. If the batter seems too wet, add additional coconut flour 1 teaspoon at a time. These muffins freeze really nicely. To thaw quickly, place individual muffins in the microwave for 40-50 seconds on 40% power. 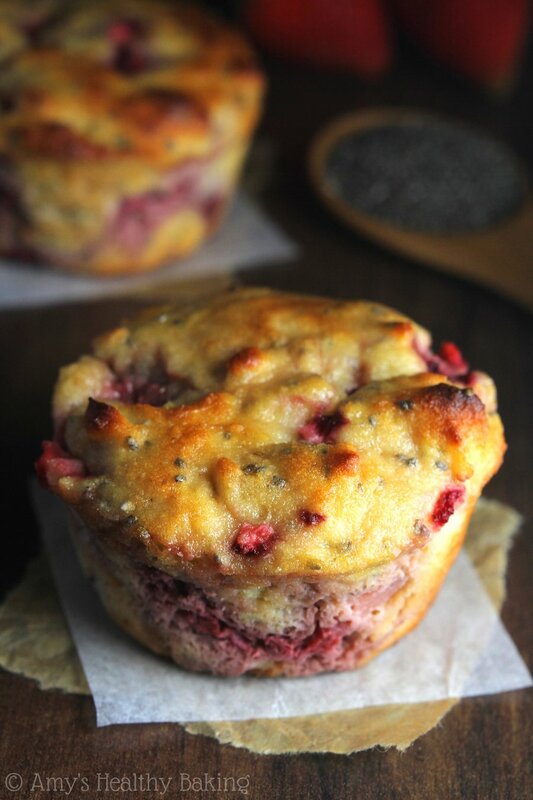 ♥ Triple Berry Chia Seed Muffins by Domesticate ME! 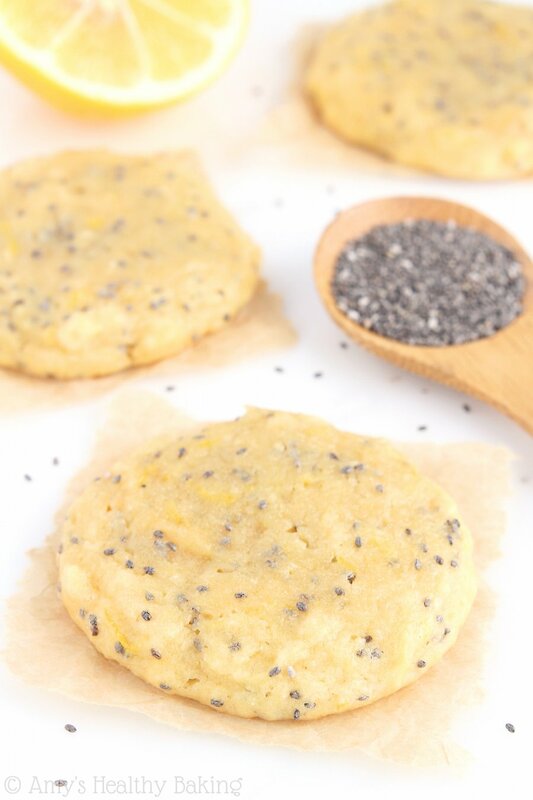 I found this recipe and they seem like a great morning snack or just anything on the go. I have tried to cook these muffins on two separate occasions now and I cannot get the middle to cook. I live in Colorado so the first time I made them I doubled the recipe but not the baking soda and baking powder. I cooked the muffins for the recommended time and temperature but they wouldn’t cook. I increased the time and they still didn’t cook. I took the temperature up to 375 and then 400 and they still didn’t cook. I added baking powder and baking soda and they started to rise but still would not cook. I added almond milk and they still would not cook. After I had realized that first batch wasn’t cooking I started cooking one muffin at a time and basically experimenting to see if I could get the middles to cook. I gave up on that batch and tried a whole new batch a few days later (today) and I did everything as listed and they still would not cook. Any suggestions?? You are incredibly dedicated Michaela — I’m so impressed with everything that you’ve tried! Although you’re at a high altitude, I still recommend following my recipes exactly as written. Numerous other readers who also live in Colorado have reported that my baking recipes work for them exactly as written, and the recipes actually turn out worse if they try the typical “tricks” that are commonly used to adapt recipes to high elevations. 🙂 If the middles aren’t cooking through fully, then it’s probably the protein powder that you’re using. I can only guarantee that the one I named will work since all protein powders behave so differently. What protein powder did you use and in what amount? I appreciate your feedback Catherine, and I’ve updated the recipe accordingly. I hope you’re able to find whey-based protein powder to try again — they really are wonderful muffins! In the meantime, my energy bite recipes and protein bar recipes all use plant-based protein powder, so those would be great options for the protein powder that you have! Stumbled across you on Pinterest, these look amazing! Thanks for the inspiration! Thanks Elle! I can’t wait to hear what you think of the muffins! Amy, these look amazing! I definitely get stuck in a rut with my baking because of food allergies but I can not wait to try this combo!! I can understand that Braiden! Being stuck in a food rut makes grocery shopping easier, but… It doesn’t always make eating or enjoying food very fun! 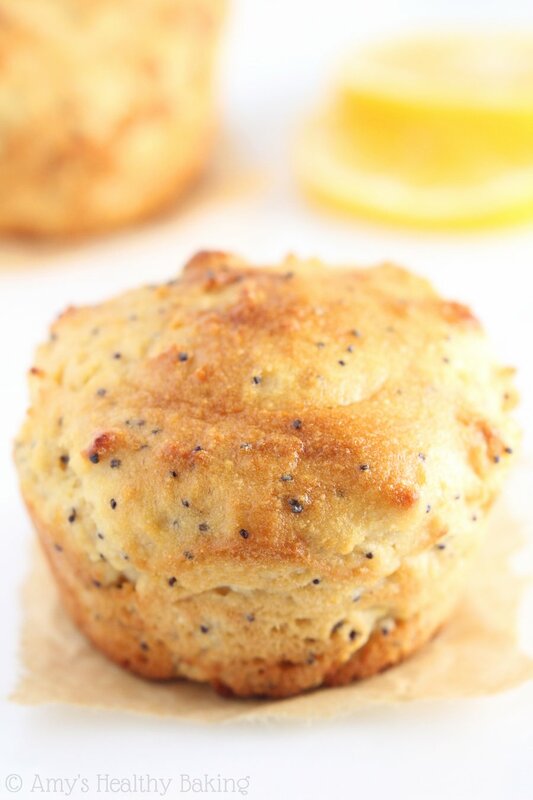 I’d love to hear what you think of these muffins if you try them! Is the batter suppose to be more moist mixture looking or like a traditional batter and wet? I did take xanthum gum out and substituted with flaxseed meal instead. I don’t know if it’s just my substitution that has made it look this way or not. Thanks. The recipes smells amazing so now just waiting to see how it turns out. Really good! I made them with limes, because I had a ton lying around and limes + strawberries is a fabulous combination. I also used erythritol instead of agave, worked fine. Thanks for the recipe! PS, your rating system doesn’t work for me if I’ve already entered all the information. So I’m just posting again to make sure these babies get the love they deserve! You’re so sweet to comment again just to rate these muffins Kyra — that means a lot to me! Thank you!! 🙂 I’m so glad you loved them! And I appreciate you mentioning your lime sub and that erythritol worked instead of agave. I always love hearing what recipe tweaks work! 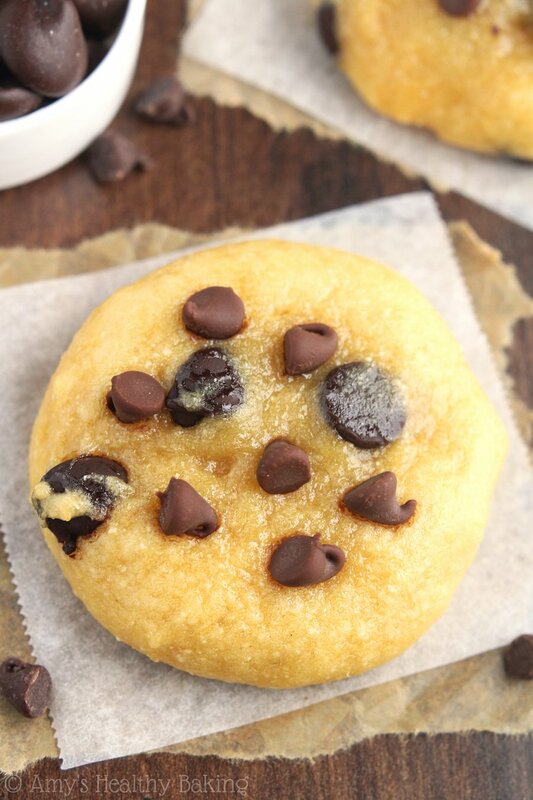 The flavor of these muffins are to die for! Just curious what the texture of the batter should be before you bake them? More runny or solid. Also the more I baked them the strawberries would leak into the batter making them more gummy. Really wanting these to turn out perfectly because of how good they taste! Any help is appreciated. Thank you! !